New Jersey Governor Phil Murphy recently signed a law that will greatly expand the benefits available to employees under the New Jersey Family Leave Act (NJFLA), the New Jersey Security and Financial Empowerment Act (SAFE Act), and the New Jersey Temporary Disability Benefits Act, which provides New Jersey employees with temporary family leave insurance (FLI). Employees may take leave intermittently for up to 12 consecutive months instead of 24 consecutive weeks. Employees do not have to seek employer approval to take intermittent leave to bond with a newborn or newly adopted child. Expansion of the law’s coverage to employers with at least 30 employees (rather than 50) on the payroll for at least 20 workweeks per calendar year. Benefits are available for family leave to care for a child regardless of age. An employer is no longer permitted to require an employee to use paid leave accruals before applying for FLI benefits. Non-unionized employers may purchase private insurance policies to cover temporary disability and FLI benefits without obtaining the consent of the majority of their employees. The seven-day waiting period before an employee is eligible for FLI benefits is eliminated. The maximum weekly benefit will increase from $650 to $860 (or 85% of the employee’s average weekly wage, up to a maximum of 70% of the Statewide average weekly wage). The number of weeks for which an employee can receive FLI benefits will double from the current six (6) weeks to 12 weeks for consecutive leave, and the amount of permitted intermittent leave will increase from 42 days to 56 days. It is important that all New Jersey employers revise their policies to comply with the changes that have taken effect already and prepare for the changes to come in the future, especially if you have between 30 and 49 employees and will be newly covered by the NJFLA as of June 30, 2019. The New Jersey Department of Labor and Workforce Development will most likely issue additional guidance regarding these changes as well as updated posters/notices to be displayed or distributed to employees. We will keep you apprised of these developments as they occur. 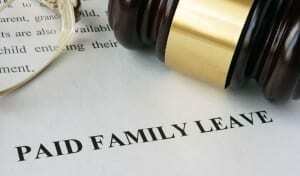 If you would like assistance drafting or revising your family leave policies to comply with these changes, please call our office at 631-794-7400 to speak with one of our HR Business Partners, or email us at info@compasswfs.com.